Insta Health is one of the most trusted and recognized hospital management systems and EMR software solution providers in the health care sector. Insta Health provides cloud based and local server based solutions to hospitals to automate their key processes - clinical, financial, operational and management processes. 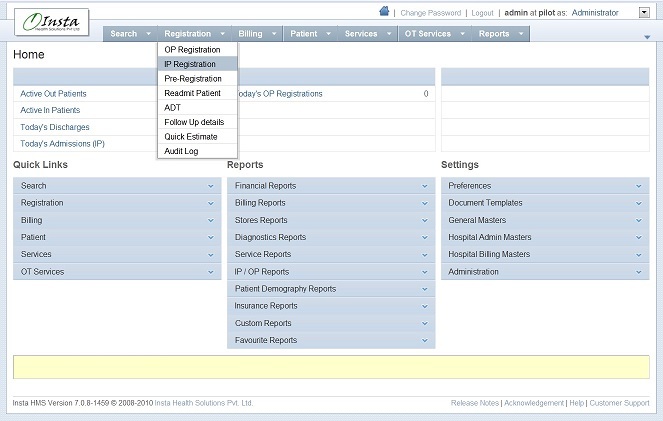 Some of the modules include: Network Reports, Registration, Billing and Insurance, Scheduler, Lab, Radiology, Services, Pharmacy, Inventory and Procurement, Bed Management, IP billing, Ward Activity Management, OT Management, Advanced Insurance, Alerts and Messaging, Doctor Payments, Referral Doctors, Interface to Financial Accounting, Foreign Exchange Receipts, Surgery Scheduler, Fixed Assets, Complaints Tracking, Maintenance and Contracts Management, Diet and Nutrition, Linen and Laundry, Ambulance and Transport Management, Patient Surveys, Patient Display System, Business Intelligence, e-Claims, Insurance Receipts Reconciliation. With its EDI (Electronic Data Interchange) engine and its capacity to match the physician’s working approach, MiddleC@re is the Orchestra Conductor of the patient workflow and your medical activities. Some of the value-added features include: Quick and easy access to patient medical records, Ease of implementation, Information consistency and Centralization, Easy to create new documents, Traceability of multiple record modifications, Paperless solution, Reinforced security with Electronic Signatures and Complete Statistics menu.